Remember how I just said in my last post that I’m cranky? Well I am. And I found something that gets my blood boiling more than when Comcast nearly gave me a stroke. I have tried every avenue to get this done and I honestly can think of no other way then to take it to the blogsphere. Maybe someone reading this can offer some help or if nothing else, I can get rid of some frustration (though I don’t see that happening until the issue is resolved). Several years ago I was put in charge of a church blog through Google for young single adults. Someone else had started and maintained it and then she moved, putting me in charge of updating and paying the yearly charge of $10 for the domain name. Two years ago I realized the blog was obsolete. The young single adults in the area utilized Facebook far more than they did this blog. So I deleted it. I admit at this point that I shouldn’t have just deleted it but ensured that I canceled the ownership of the domain name. Last year, around October, I got emails telling me the domain name would be renewed. The email provided a link for me if I wanted to cancel the renewal so I clicked on it. I was unable to log in (even though it was my Google credentials which I knew because I use them all the time). After several failed attempts to cancel, I gave up and tried again after the renewal (thinking maybe it was a ploy to get me to pay anyway and after I had then I would be able to log in). Nope. So this year, in September, I started to get the emails again. I know it’s only $10 but seriously? I don’t want to be paying for nothing. this ICANN policy, visit http://www.icann.org/en/resources/registrars/consensus-policies/errp. I tried logging in to the Admin Console (again), I tried going to the link fromt he Support Team. Nothing. And you know what? No contact information. All the emails have said, “Do not reply to this email” but they’ve never offered another one! So I took it to Google search – certainly their own search engine could tell me how to contact someone. Nothing. 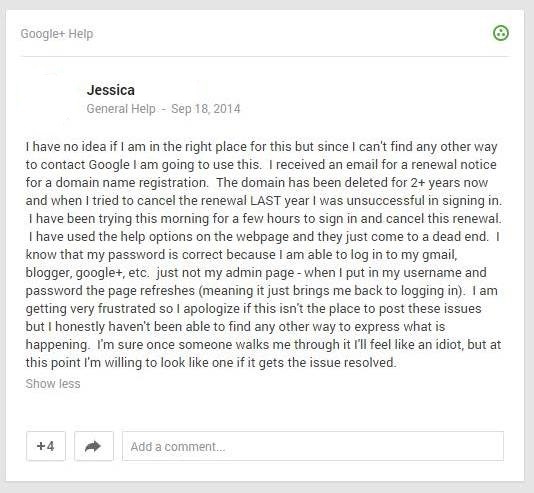 I did find something though from another person on the web that said to post to a Genera Help forum on Google+. As you can see – 4 people liked it, but I received no answer. I did however get another email two weeks later that reminded me they were going to renew. And another a week later. And another a week after that. And salt to the wound – the next week I got an email excitedly stating that my renewal was a success. And then three weeks later I received an invoice – which I always thought meant you hadn’t paid it yet but they had clearly already charged my card. So that’s where I am. Does anyone have any suggestions? I was going to dispute the charge on the credit card but I didn’t see the option for the reason being that the “merchant” has made it impossible to cancel the account. My next idea? Just cancel the credit card. But I’m interested to know if anyone out there has any thoughts.